DayBack respects the relationships you've made between events (or custom objects) and the other people and things in your Salesforce org: the Contacts, Leads, Opportunities, and Accounts to which events are attached. This article describes how to configure DayBack so you can see these related people and things and select which people or thing an event is linked to. 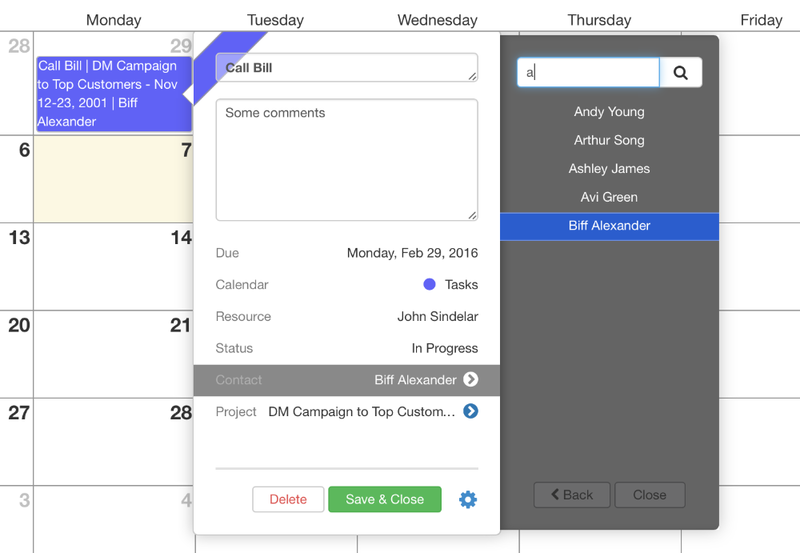 Configuring the Whos and Whats related to your calendar items. Just below DayBack's settings for field mapping you'll see a section for "Contact Objects" and "Project Objects". These sections let you describe the possible people (contacts, leads, etc.) and entities (campaigns, cases, etc.) to which you can link calendar events. You can create as many contact and project objects as you'd like for each source. For example if you have a custom object called "Goal" and would like users to be able to associate that with a Contact or a Lead, you'd create two contact objects: one of contacts and one for leads. If you are relating Events or Tasks to a Custom Object, then you'll want to set this Custom Object to "Allow Activities." This creates a special Salesforce relationship between the Custom Object and the Activity's WhatId (Related To). If you want your users to be able to look-up and modify this relationship then just need to add the Custom Object as a Project Object for the source and you're done (don't forget the __c in the Object Name). If you have a Custom Object as a source and want to relate it to another object, then create that Master Detail Relationship in Salesforce and then the Reference Id will be available in the field mapping choices for ProjectId. As above, add a Project Object for this relationship if you want your users to be able to look-up and modify the relationship. Note that these settings are used for making links to people in the calendar: people already linked to events on your own Salesforce pages will show up in the calendar's display of an item even if the Contact Objects section is not completed. The same is true for Project Objects. If you don't want your users making or editing these relationships in the calendar just leave the Contact Objects and Project Object sections blank. Selecting which "who" object you'd like to link to this Task. Object Name - this is the name of your Salesforce object, usually singular. If you're not sure what Salesforce actually calls a particular object, please refer to the Object Reference for Salesforce. Display Object As - here is where you give the object a name that will appear in the drawer choosing an object as you're editing an event. Search Field - Here is where you specify the field that should be searched when users are looking for this object. For standard Salesforce objects you'll almost always want "Name" here (without the quotes). For example. in the screenshot above you'll see the use has typed "a" into the search field and that DayBack has returned those contacts with an "a" in their name. Display Field - When DayBack presents a list of matching records based on your search field, which field(s) should be used to display the results. Again, this will almost always be "Name" (without the quotes) but this entry does support concatenated fields separate by a comma. For example if you were working on the Project Object "Case" you might want to display "CaseNumber,Subject" (without the quotes). Remember that field names in Salesforce are case sensitive. DayBack will respect multiple contacts you have added on your event's page, but you can only add a single contact when creating an event in DayBack. For existing events with multiple contacts, DayBack will show the contact you've flagged as "primary". DayBack will allow you to edit events that have multiple contacts providing you don't edit the contact--editing any other fact of the event will be fine but you'll see an error if you try to edit the event's contact: those edits will have to be made on your event's page. You can jump quickly to the event by clicking the "gear" at the bottom-right of the event in DayBack and the clicking the "Go to Event" custom action. By default, when you configure DayBack to let you select the Lead, Contact, or Opportunity for an item in the calendar, it will let you select from any of the Leads, Contacts, or Opportunities in your org (this is true for any entity, not just these three). But you may want to let users select from only active Opportunities, for example. Fortunately, this is easily done. When you configured your Opportunity in DayBack you selected (or we'd selected for you) a "search field" and a "display field". You can filter that list of opportunities if the search field you select is a formula field defined to only return the name of the opportunity if it is active. Pretty cool. So create a new formula field in opportunities that only returns the opportunity name if you'd like to see that opportunity in your DayBack list. Then select that new formula field as your search field in Administrator Settings. That's how you can filter any of these related lists: just make the search field a formula that is only true in some cases.